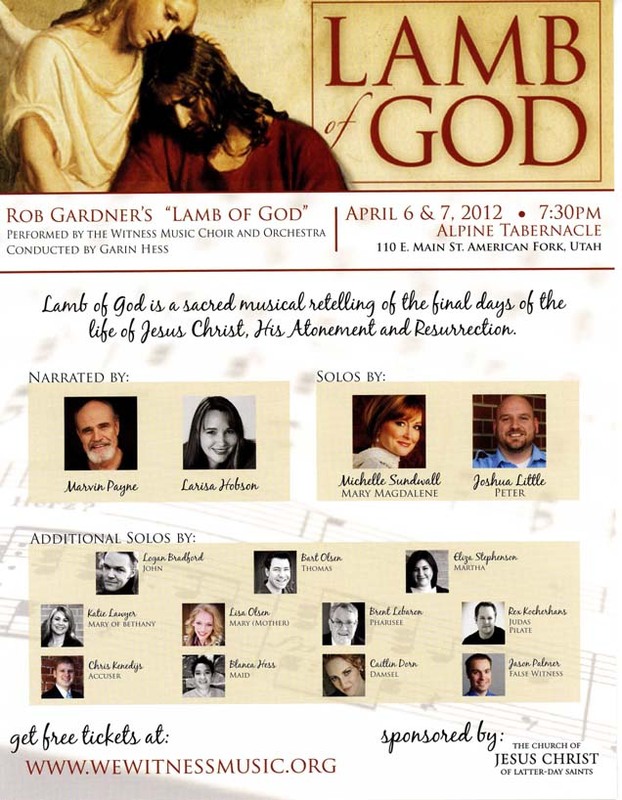 Witness Music was founded in 2011 by Garin Hess, primarily for the purpose of performing Rob Gardner's "Lamb of God" annually each spring. The first performances were held at the Alpine Tabernacle in American Fork, Utah on April 6 and 7, 2012. The dress rehearsal on April 5 was also opened up to the public due to demand. All concerts were well attended. Garin Hess conducted the choir and orchestra. 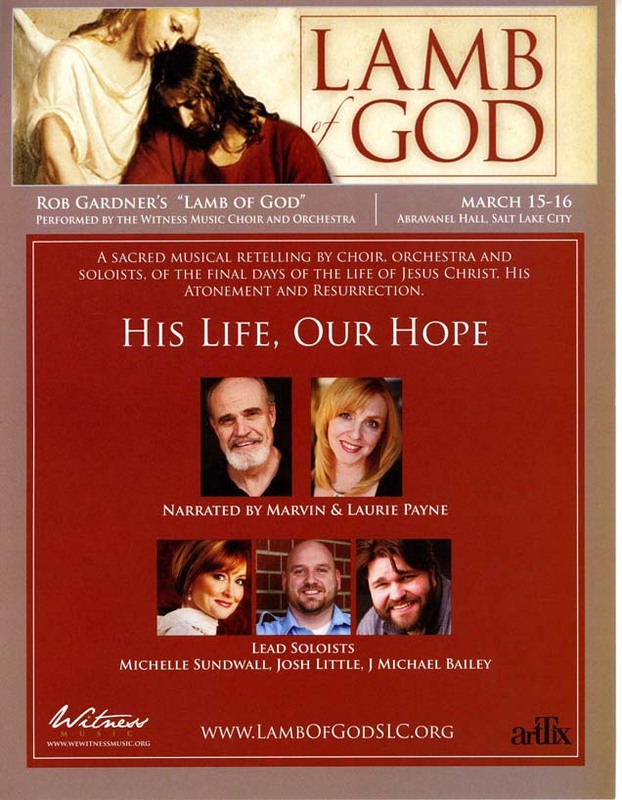 In 2013 the performances were held at Abravanel Hall in Salt Lake City on March 15 and 16. This is a spectacular hall for performing, and we were pleased to have a substantial and very appreciative audience for three performances. Jason Robison joined the Witness Music team this year as choir master, and Garin Hess conducted choir and orchestra in the performances. 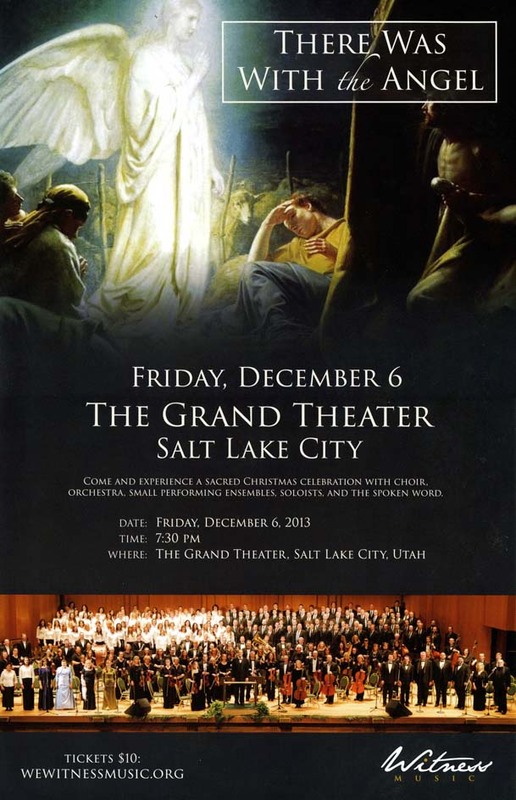 A new addition for 2013 was the Christmas Concert, There Was With the Angel, held at the Grand Theater in Salt Lake City on December 6. It was a wonderful experience for all involved, one we hope to continue in the future. The 2014 performances of Lamb of God were held in the very large auditorium at Cottonwood High School in Salt Lake City on March 28 and 29. As at Abravanel Hall, we held a Friday night performance, a Saturday matinee and a Saturday night performance. 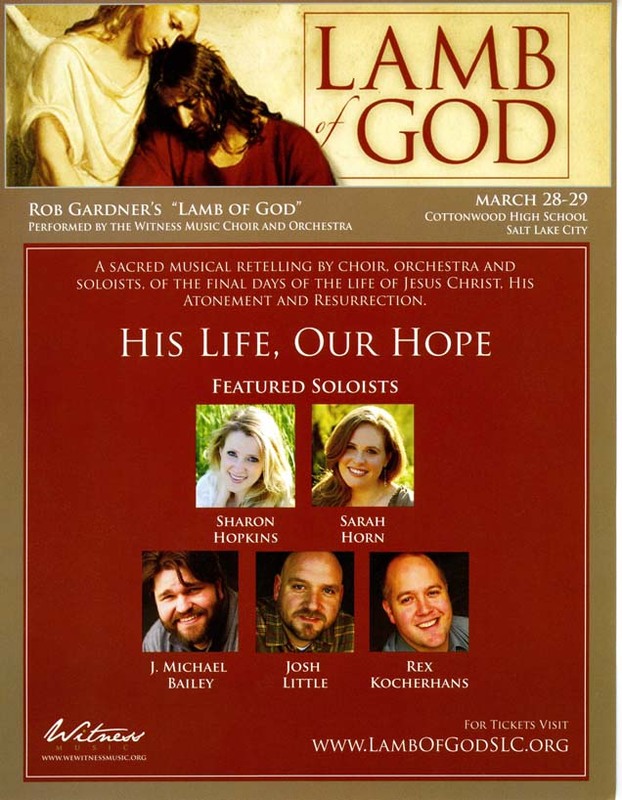 Again Garin Hess conducted choir and orchestra, with Jason Robison serving as choirmaster. Following the 2014 performances several changes were made. Garin Hess decided to step back from conducting each year so he could turn more attention to overseeing the national organization of Witness Music, which now had several chapters. He turned what had now become the Utah Chapter over to Jason Robison. So the 2015 performances of Lamb of God incorporated several more changes. While Jason Robison took on the challenge of serving as Chapter President, as well as rehearsing and conducting the choir and orchestra, Bob Matthews, who had been serving as choir president, now assumed the management of the organization as General Manager. Instead of one venue, in 2015 there were performances in two locations, in Orem and in North Salt Lake. 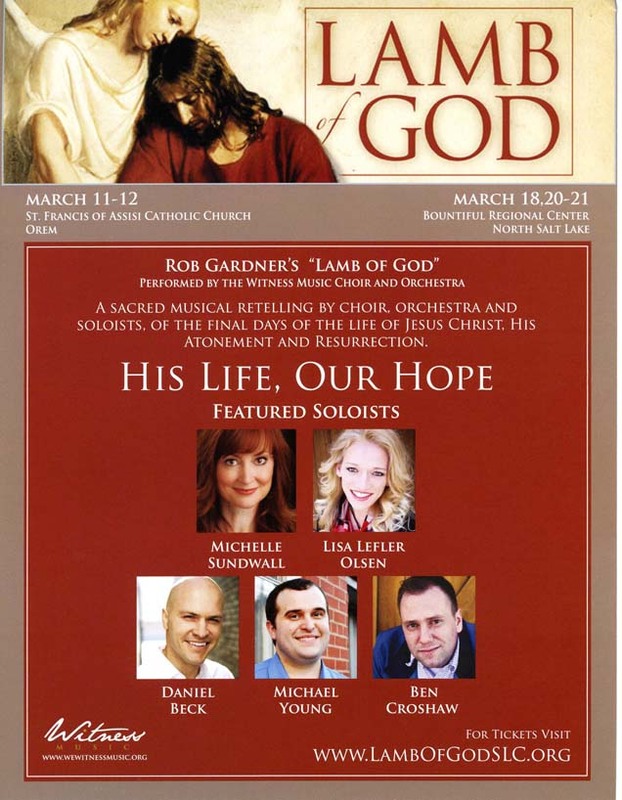 March 11 and 12 performances were held at St Francis of Assisi Catholic Church in Orem, Utah. On March 18 a special performance for youth groups was held at the Bountiful Regional Center in North Salt Lake, followed by a Friday night performance March 20, a matinee and evening performance March 21. 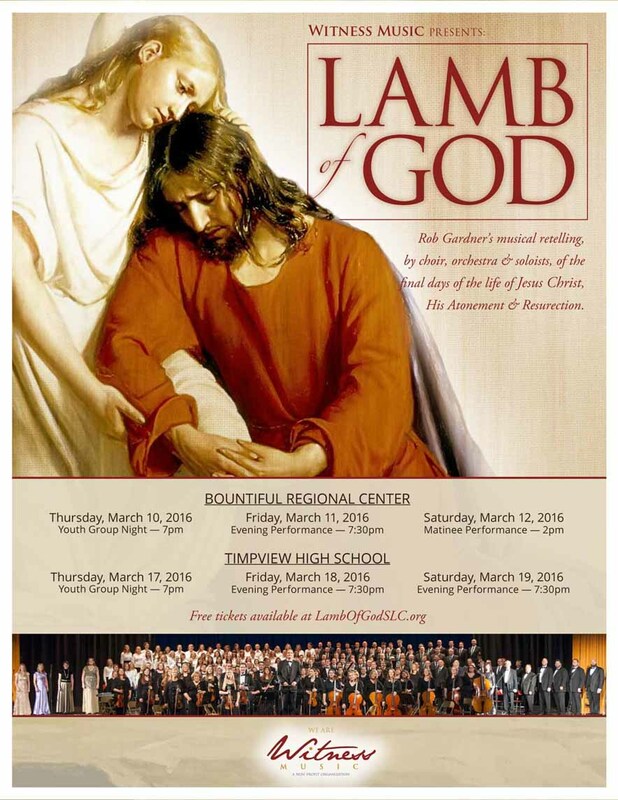 Lamb of God 2016 was again presented at Bountiful Regional Center for three performances, then at Timpview High School in Provo for another three performances. The six performances together resulted in our largest audiences to date for this wonderful event. In April 2016 a small choir from Witness Music performed Lamb of God for inmates at the Utah State Prison in Draper, our second consecutive year of having this privilege. Our performance at the prison is a powerful experience for both the performers and the audiences. As we prepare for our 2016-2017 Season, we are excited to announce the addition of Handel's "Messiah" to our lineup. This performance will be held on December 2 and 3, 2016 at the Alpine Tabernacle in American Fork. We are continuing in a 20-year tradition that was started by Timpanogos Chamber Orchestras and Lois Stout and Lisa Brodie. We invite you to sign up for our mailing list and watch for announcements if you would like to perform with us or attend our performances.